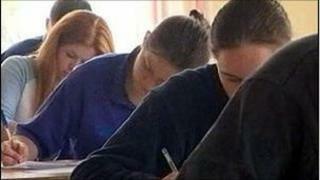 The exams body in NI has revealed that it found errors in two question papers over the last two weeks. It follows a warning about accuracy from the exams watchdog, but the CCEA has only just given details of its mistakes. Mistakes were found in two exams, one A-level and one GCSE. The CCEA has apologised for any distress caused to students affected by the errors. An early check of the A-level further maths paper on 31 May found an error and the paper was returned to the printers to be altered. However a new mistake then appeared in the paper and that was not detected in time. One hundred and twenty two pupils in 32 schools were affected. On Monday, a wrong figure was included in a table for a GCSE business studies paper. The exams body said no student will have been disadvantaged by that. CCEA regulator for Northern Ireland, Roger McCune said the errors were "disappointing and unacceptable". He said there had been a number of inaccuracies in papers across the five awarding bodies. There are five GCSE / GCE awarding bodies that can operate in NI. "We felt as regulators, England, Wales and ourselves that we should write to the awarding bodies to express our disappointment at what has happened and to say that this is unacceptable," Mr McCune said. "We have asked them to review the papers that have come urgently, we're about half way through the summer series, as a reassurance to ensure that those candidates who have still to take papers and also for their parents that there will be no disruption. "What we will then be following this up with is to ask the awarding bodies what they are doing in those particular instances to ensure fairness to all candidates." The exams watchdog Ofqual has ordered exams bodies to double check their papers after a series of errors by three other boards.